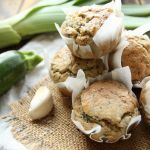 These healthy gluten-free zucchini muffins make an excellent quick breakfast, on the go snack or brunch, and are a sneaky way to get more greens into your diet. Pair them with some tahini, baked potato latkes, and a salad, and you’ve got yourself a wholesome meal. 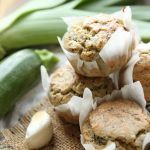 For these zucchini muffins, I used a mixture of teff flour, brown rice flour, and chickpea flour, and added a teaspoon of nigella seeds, which really enhances the flavor of these vegan zucchini muffins. I sauteed the leek and zucchini until they started to lightly brown, then added some crushed garlic, and seasoned well with sea salt. The simple reason as to why I like to saute my veggies before adding them into a batter is because it brings out that extra bit of flavor, which is very noticeable after baking, and always makes a difference to the overall flavor of any dish. 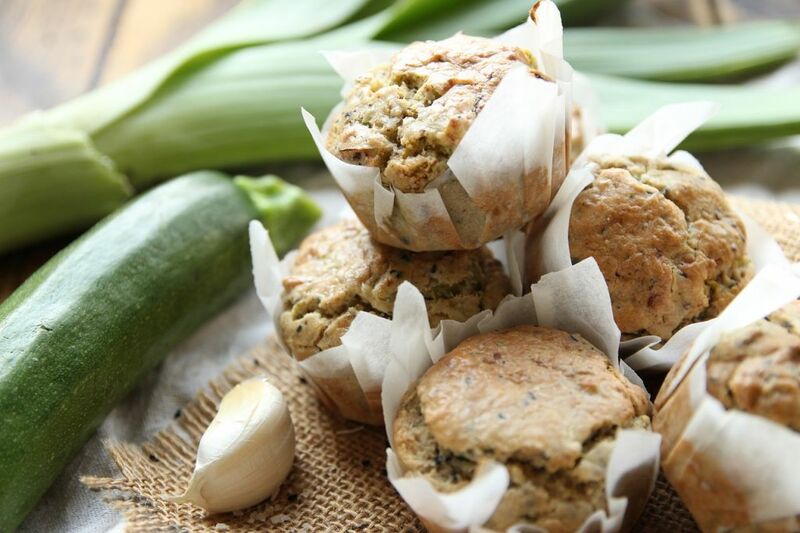 So, are you ready to embark on a delicious savory muffin experience? Place the ground flax seed and water into a medium-sized bowl, mix and set aside. Grate the zucchini, finely slice the leek, then heat a pan over medium heat. When hot, add the olive oil, zucchini, and leek. Fry until they start to brown, roughly 5 minutes, occasionally stirring. Peel and crush the garlic cloves, and add them to the pan along with the sea salt and nigella seeds. When ready, take off the heat and set aside. Add the almond butter and coconut milk into the flax seed bowl, and mix well until combined. Place the teff flour, baking powder, chickpea flour and brown rice flour in a separate bowl, mix together, then add in with the wet ingredients. Mix well until your zucchini muffin batter is combined. Finally, add the cooked leek and zucchini from the pan into the bowl, and briefly mix again. Scoop or pipe your muffin batter into 6 muffin holes lined with cupcake liners, then sprinkle a few nigella seeds on top and pop into the oven for 14 – 18 minutes, or until they’re lightly golden brown. If you’re not sure that your muffins are ready, then keep them in the oven for a few extra minutes. Either way, they’ll taste great. When ready, take out to completely cool and enjoy. 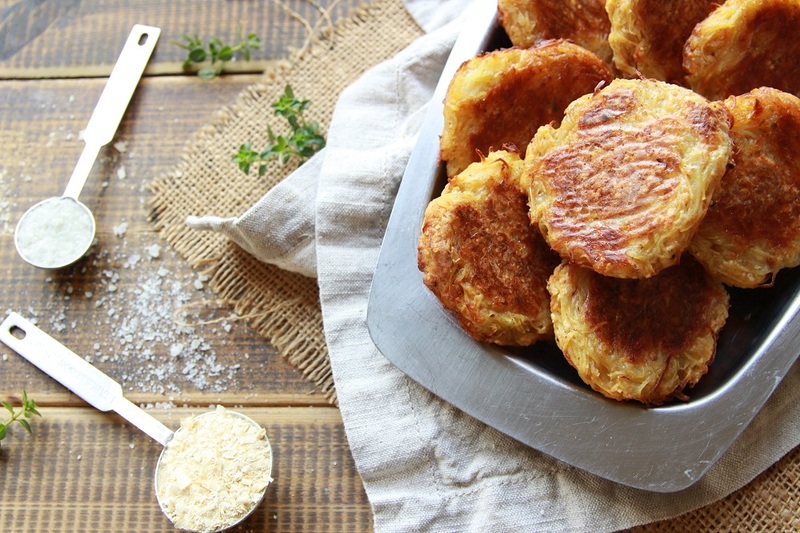 Finally, eat your freshly baked vegan zucchini muffins on their own, or paired with my delicious 6 ingredients Baked Potato Latkes, a small bowl of tahini and a fresh green salad. ← My Go To Baking Essentials + 10 Recipes To Try!